Jacob loves working with wood and he is frequently the last one to leave the carpentry shop at which he is apprenticed. When a contest for the best carpenter to work on the synagogue arises, Jacob is determined to be the one. Very good. The rabbi teaches Jacob that his gifts are from God, and should be used for God. Jacob learns that giving to God's children is like giving to God. Jacob puts his work for his father before his work for himself. God is talked about, accurately. Jesus is born and, though Jacob doesn't know He's God, that fact is hinted at. Jacob is woken up by the gleam of the star. 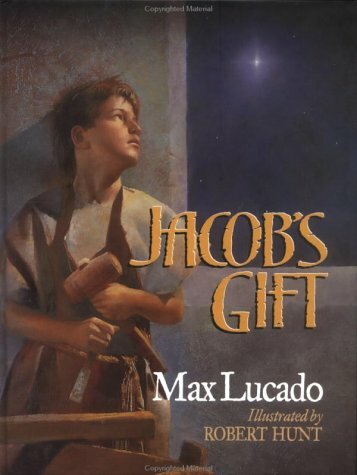 A lovely story with beautiful, full-page illustrations, Jacob's Gift teaches a good lesson about giving and where skills come from. It also shows a different perspective on the birth of Jesus. A good family story, particularly around Christmas. Note: Some editions come with the movie made based on the book. In the movie, some of the children are mean and pick on Jacob, destroying some of his work. Jacob shows irritation and impatience. His sister has a doll, which the Jews believed were forbidden.